Recognize that hashtag? If you do, you know the time is fast approaching for the yearly rush to create something wonderful! Stunning! Exciting! Or at the very least... long. Fifty thousand words in one month is the goal of NaNoWriMo writers. We're talking one thousand six hundred and sixty seven (if you round it up) words per day for 30 days straight! Whew! I'm exhausted just thinking about it! This will be my first year as an official participant of the event. Last year, I was only brave enough to register (personally, I found that a pretty good accomplishment in and of itself!). Now that the day is fast approaching, I'm getting nervous. Furiously outlining and researching for the project, I am hoping that I am prepared enough for the challenge. Here's a quick blurb for the novel that I am planning to write. I started it earlier this year and I am planning on using NaNoWriMo to finish it. Let me know what you think. Ben Pruett has no family and no future, till he remembers his life before he came to Earth and the father he must save. Nathan Theed was born to a body too small for his spirit and must fulfill the reason he came here before he can return home. Alana Drake was imprisoned to contain a political secret. Now, to save the galaxy, she must expose herself to it, when all she wants to do is hide. As one by one they realize their purpose, this group of strangers must figure out a way to escape the prison that is Earth. Guided by a poorly written novel, and pursued by Earth’s warden, the trio must escape both police and interplanetary forces to return Alana to her rightful place in the galactic government. Found your husband in bed with another man? Informed that your self-absorbed mother was pregnant (from her thirty-year old boyfriend, who also happens to be an ex-classmate of yours)? Now, what would you do if this all happened in the same day? Natalie Spencer from Milwaukee, does what I, and many others, would want to do, but probably wouldn't have the courage (or money) to pull off. She jumps on the first international flight to any English speaking country! Four Thousand Miles, by Jesi Lea Ryan, is about healing and creating a life again after losing it all. Natalie finds a friend in Gavin Ashby, a songwriter from Pluckley. Thinking that her life can't get any worse, she accepts an offer to recuperate on his family farm while helping renovate the stables into guest rooms. She becomes fast friends with Gavin's sister, Maggie, and her daughter, Emma. However, this family is full of secrets and struggles of its own. Gavin is introverted and recovering from his past, while Maggie and Emma struggle to connect as mother and daughter. Natalie lands in the midst of their struggles as she finds herself falling in love with Gavin, an idea that is not acceptable to some at Flenley Farm. While reading Four Thousand Miles, I found Natalie's time at Flenley Farm a bit too perfect. She fell into life there easily, and for a bit, there seemed to be a lack of drama in the story. However, all good things come to an end and Natalie's life gets more complicated as the story goes on. She realizes that the life she is creating in England may not be right for her and has to make important decisions for her future, including what continent to call home. Overall, I enjoyed the novel. I'm not one for heavy romance, so I was happy with the love story that developed between Natalie and Gavin. I also enjoyed the plot lines that developed between secondary characters and how those interwove with the bigger picture. Most of all, I loved the imagery of the English countryside. I have always had a fascination with England, and Ryan makes the country come to life. "I wouldn‘t care if you drew a ring on my finger with a ballpoint pen. All I want is you." Read this book of you like contemporary women's lit or romance novels (even though I wouldn't classify this as a romance novel, I think you will still enjoy it). Get your copy of Four Thousand Miles by Jesi Lea Ryan HERE! Have you ever had to call 9-1-1? Have you ever had to call for someone else? Unfortunately, I have had to do this a couple of times. Once when my son was smacked in the head with a golf club (Do you know how much head wounds can bleed!? ), and another time when we thought someone was breaking into our house (Turns out it was a friend who wanted to talk to us but not wake up our children. My husband almost shot him!). Calling for emergency help is usually surrounded by emotional circumstances. There can be tension, sadness, anger, fear, desperation, confusion, and other emotions all vying to be dominate at once. It can create excellent drama (or comedy if the situation is right), thus the slew of medical based dramas on TV. They are popular because they invoke emotions within us and get us reflecting on our own lives. What would we do if we were in that situation? Would I be prepared to deal with that? Is that hot young actor who plays Dr. So-and-So single? Start a story with a call to 9-1-1 or one that centers around calling emergency services. Each week for the past few months (with a few exceptions) I have participated in the 5 Minute Fiction Challenge found over at Write Me! Jerry had already visited the first five people on his list, but there were many more to see tonight. Sixty in all. Sixty people he wanted, no needed, to see before the authorities caught up with him, and they would catch up to him. He didn’t delude himself about that. Number Six, Seven, and Eight lived about thirty minutes away from the rest, but they were worth the time lost. Number Six had betrayed him. She’d married Number Seven after dating him for over a year and breaking his heart. Number Eight was sorry the result. They would all have to go. All sixty who had hurt him, broke him, rejected him, scolded him, or lied to him. All sixty who had made him the mad man he was today. They would all get to see him one last time. He knocked on the door. He had no reason to hide from anyone now. He was confident, he had the upper hand. There was no answer. There were a few lights on in the back of the house so he walked around to the kitchen. Peeking in the windows, the house looked abandoned. The knob was locked, but was a quick and easy fix. He let himself in and took a look around. Meals sat half eaten on the kitchen table. A cordless phone on the counter. He picked it up and threw it out the still open door. Turning around, he was met with the barrel of the shotgun. It wasn’t the end he had in mind, but it would do. He raised the hand with the pistol and pointed it at Number Seven. Not sure if he got a chance to pull the trigger, his world went dark. 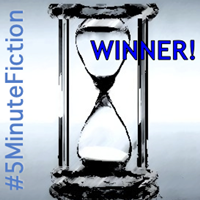 You can join the 5 Minute Fiction Challenge each Tuesday at 1:30pm EST. If you don't write for the challenge, you can still vote for your favorite story. Visit Leah Petersen's blog, Write Me! Row upon row of grape vines were flaming behind their house in the valley. It was twilight on a dry summer night, no rain for weeks. She swore this was the last time she'd pretend everything was fine when he returned from the other woman's bed. His empty promises rang in her head as she poured the remaining lighter fluid and dropped the match. When he pulled in the drive, he'd find his fortune burning in the California night. She and the boy would be long gone by then. I'll list one or more ideas in a post that should get you thinking of a story. It may be a word, phrase, picture, or even a song that can start inspiration. If you find one of the prompts interesting enough to write something, let me know in the comments section. You can post the story itself, or feel free to leave a link to your blog, etc where you posted the story. I may even feature some in future posts (with your permission, of course)! There's no time involved, so if you read a story starter new or years from now (if I should be so lucky to still be around) feel free to still participate. I will also post a story inspired by the prompt as well, but seeing as I do generate them quite randomly and I want to give you the chance to come up with ideas on your own, I will do this in the near future. "Row upon row of grape vines..."